Help ease the aggravation of fly population and other biting insects from inside and out! The same great product that over 25,000 horses have enjoyed the benefits of since 2001, is now also available with the added benefits of Alltech's LACTO-SACC probiotics to help maintain a healthy gut. 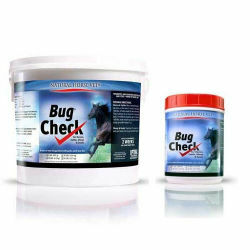 If you've been disappointed by garlic or diatomaceous earth alone, you are going to love our Bug Check. Contains added thiamine and brewers yeast. Brewers yeast is a great source of B vitamin & natural flavors.